At the second anniversary of the Citizens United decision, there can no longer be any doubt—the political world has been changed in profound ways, and for the worse. If there’s a general sense in this election cycle that anything goes—at least in terms of political money and advertising—it’s in part because that Supreme Court decision, which struck down limitson independent political spending by corporations. Lax enforcement of other campaign laws, and the Court’s hint that it might go even further, have also contributed to what is sure to be an ugly, big money election. Is there any way to correct for the damage Citizens United has wrought? There’s little chance that the Supreme Court will reverse course, not before at least one of the five Justices in the Citizens United majority is replaced. Faced with that reality, a handful of organizations have begun to push for an amendment to the Constitution to reverse Citizens United. On Tuesday, the country’s best-known campaign finance reform group, Common Cause, joined the amendment movement, proposing to place initiatives on the ballot in several states calling on Congress to pass such a constitutional amendment. Unfortunately, this is not only a futile project, but an idea that poses a danger to the cause. The long-standing movement for campaign finance reform has often been weakened by its tendency to pull in several different directions. A decade ago, reformers were squabbling over whether to focus on limiting contributions to $100, banning soft money at the federal level, or enacting full public financing in the states. In recent years, however, a welcome consensus has emerged in favor proposals for public financing, drawing on successful programs in Arizona, Maine, New York City and Connecticut. A majority of Democrats and a few Republicans co-sponsored the Fair Elections Now Act, based on those successes, in the last Congress. The constitutional amendment movement will be yet another distraction from these efforts. The main problem isn’t that the effort to pursue a constitutional amendment would be futile—though it certainly would be. Advocates know that, and point out correctly that futility has never, in itself, been an argument against pursuing a constitutional amendment. After all, most efforts to amend the Constitution fail, but the efforts to pass them can have residual benefits, by giving supporters a long-term vision along with incremental steps that can be achieved through legislation or cultural change. The Equal Rights Amendment is the classic example of an amendment that fell short, but gave its advocates an organizing principle and clear goal that allowed them to achieve incremental wins along the way. The legal framework for gender equality is arguably as strong now as it would be if the ERA had been ratified. A proposal to amend the Constitution to establish a right to vote would have a similar movement-building value. Most people assume the right to vote is in the Constitution, and understanding that it isn’t can lead to a healthy discussion about why we restrict voting in so many ways. A movement for a right-to-vote amendment would give focus to efforts to overturn voter identification laws and allow same-day voter registration. A movement to overturn Citizens United by amendment, however, would take a different form, because it would be retracting rights rather than expanding them, and thus would have few residual benefits. State, local, and federal laws limiting corporate political spending would still be considered unconstitutional until the day the amendment, after passing both houses of Congress with supermajorities, was ratified by the legislatures of 38 states. By reinforcing the misconception that nothing can be done about the current condition of money in politics until the Constitution is amended, the amendment movement would undermine progress on other solutions, including public financing, improvements in corporate governance to give shareholders more say in political contributions, disclosure improvements, and better enforcement of existing laws by both the Federal Election Commission and the Internal Revenue Service. If it were possible to pass an amendment through Congress and get it ratified by 38 states, it would also be possible to enact full public financing—the optimal solution—at both the federal and state level. The case against the amendment movement also isn’t based on the text of the amendment—not least because we don’t know what the amendment would say. I’ve found at least five different versions of an amendment, and in introducing its initiative on Tuesday, Common Cause President Bob Edgar said the organization would be “neutral” among the alternative proposals because now was not the time for “wordsmithing.” Call it a movement to pass an amendment to be named later. There’s quite an irony here. After all, what is Common Cause? What are most of the organizations that make up the Move to Amend coalition? They are corporations. Not just corporations, they are corporations that have been created for the explicit purpose of organizing and amplifying political speech, or of influencing the U.S. political process. Sure, most of them are non-profits (as was Citizens United itself), and another version of the amendment, the one introduced by Senator Bernie Sanders, limits its denial of rights to for-profit corporations. But the distinction between non-profit and for-profit corporations is a blurry one—Blue Cross and Blue Shield insurance companies, as well as many large hospitals, are structured as non-profits, too, and pay their CEOs, and their lobbyists, millions of dollars. The corporate form is simply how we organize any collective effort in the United States. And while corporations aren’t people, and they can be and should be regulated, such efforts to regulate ought to at least begin with the presumption of a right to free expression. Regulations on corporate speech, just like limits on speech by individuals, have to be justified as serving a valid public purpose. A law, for example, barring all corporations, including Common Cause, from speaking out in favor of campaign finance reform would be a disgraceful encroachment on free expression—but perfectly permissible in a world in which corporations have “no rights.” Are corporations such as Common Cause really willing to endorse the idea that they have no basic right to speech? Further, “corporate personhood,” while a significant focus of Justice John Paul Stevens’ dissent in Citizens United, is not actually the key to the decision. Lawrence Lessig points out in his recent book, Republic, Lost, that the Court reached its decision in Citizens United “not because it held that corporations were ‘persons’ and for that reason, entitled to First Amendment rights. Instead, the opinion hung upon the limits of the First Amendment.” The Court’s true error was in its narrow definition of corruption. Whether it comes from individuals or corporations, the Court held, independent political spending, not coordinated with a campaign, had little potential for quid pro quo corruption, and thus was protected by the First Amendment. But quid pro quo is not the only kind of corruption there is. The general dependence of elected officials on donors and outside supporters (such as this election’s Super PACs), Lessig argues, creates a broad and unspecific corruption. It results, for example, in members of Congress hesitating to regulate financial firms simply because they spend so much time with financial executives and rely on them for their campaigns. A broader view of corruption would permit some regulation not only of corporate political spending, but also of spending by individuals. We can’t know for sure, but most of the notable Super PAC funding in the 2012 primaries seems to have come from wealthy individuals, such as casino mogul Sheldon Adelson, on behalf of Newt Gingrich, or Jon Huntsman Sr., on behalf of the recently departed candidate Jon Huntsman Jr. And in the case of privately held corporations such as Koch Industries, it really doesn’t matter much whether the Koch brothers contribute from their personal fortunes or from the corporate treasury they control. Restricting only corporations, while it would undo the specific legal change wrought by Citizens United, would actually do little to change the wild west culture of money in today’s politics. It’s corruption, not “corporate personhood,” that needs to be at the center of our efforts to change the post-Citizen’s United world of money in politics. 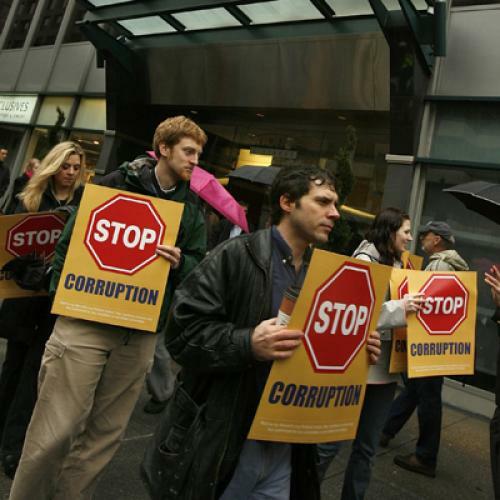 The way out would be to build a public and legal case for a broader and more accurate concept of corruption, starting from Lessig’s framework, while continuing to expand workable and constitutionally secure reforms such as public financing. Anything else, such as a campaign for a not-yet-written amendment to the Constitution, is just distracting mischief.